A Way To Jump Start Kids Into Hunting! The recruitment of young hunters into hunting is definitely quite important in regards to the future of hunting, especially in today’s high-tech society where kids can easily be drawn to multiple interests other than the outdoors. This is why I had strongly supported lowering the age to allow kids to go hunting, and then finally (after much debate) having a certain age requirement being dropped entirely was a definite no-brainer for me. I fully support the “Mentor” hunting license which allows kids of any age to be able to hunt with adult supervision, and without the requirement of a Hunter Safety Certificate. Being mentored by a knowledgeable and responsible adult into hunting has been taking place for eons and is quite frankly the natural process of passing on passion, knowledge and skills to the next generation. I’m also a firm believer that it should be up to the parents to determine as to whether or not a child is ready (and willing of course) to go hunting. This does not mean I don’t support Hunter Education, which I consider as being a very important matter because it has created a much safer atmosphere today in hunting overall. In fact I am a Hunter Education Instructor, and decided a while ago that if I was going to talk the talk, I’d best walk the walk and play a role in matters (Hunter Education requires volunteers to keep it going). The Mentor Hunting License is only for kids nine and under (and a properly mentored kid is being fully adult supervised – it is how I learned to hunt long before Hunter Education). If a kid wishes to continue on into hunting, Hunter Education eventually becomes a requirement to purchase a hunting license. I also fully support all the special youth hunts (such as the recent youth deer season) because I consider them to be a necessary “jumpstart” to provide kids an ideal (and uniquely their own) atmosphere to venture into hunting. When the first youth deer season came about 17 years ago, I felt blessed to be able to take my youngest son Joe out and truly work with him one on one because I wasn’t allowed to hunt (my only hunting tools are binoculars, deer calls and a field-dressing kit). This meant I was solely the hunting guide and mentor, and that worked for me. I didn’t have this unique opportunity with Joe’s two older brothers, Jake and Josh, and back then kids had to be age 14 and have a Hunter Education Certificate in order to be able to hunt deer with a firearm. I truly appreciate the atmosphere of placing my entire focus on the kid while in the field and find it quite rewarding. When Joe became too old for the special youth hunts, I made a point of “adopting” kids for the special youth deer hunts, who really wanted and needed someone to take them hunting. It is called “passing it on”, a very important part to hunting. Needless to say I was none too pleased when the early antlerless deer season was combined with the special youth deer season a couple years ago, which means an adult supervising the kid, can also be out their hunting too, except for antlerless deer only. In my mind, there is something lost and truly lacking in that concept and I have refused to participate as a hunter in it. When I take a kid hunting on the special youth deer hunt, I leave my hunting arms at home. Although I have no problem in putting a plump doe in the freezer during an early antlerless season when it is a completely separate issue from the youth hunt, I haven’t taken a doe during that timeframe since everything was combined, because there is always a kid out there who needs someone to take them hunting. I’ve heard pretty much all the reasons the naysayers have about the special youth deer seasons as well as about kids nine and under (being “too little”) and I fully disagree with them. A main gripe they all have is that they never had such an opportunity (aka a jumpstart) so the kids shouldn’t have one either. (Since when is it wrong to wish something different and better for the younger generations)? There are also some who believe the kids have an unfair opportunity to bag “vulnerable” big bucks which, sadly, won’t be available for them (the naysayers) when the regular seasons come about (The youth deer hunt accounts for less than one percent of the overall annual deer kill statewide which certainly isn’t an astronomical figure at all). And there are others who claim the parents are out there to bag the big bucks while having the kid along allows them to do so. All I have to say is there isn’t a deer running around with my private brand on it. It belongs to whoever legally (and ethically) kills and tags it. I always tell a kid under my wing that he or she can shoot any deer they wish, big or small, because it is their call to make. My only part is to make sure it is an ethical (and safe) shot according to the kid’s capabilities (a couple years ago I called in two bucks together, a 6-point and a real dandy 8-point and I did recommend putting a focus on the dandy, but it was the kid’s call, and I was real pleased when he put the 8-point down on the spot at 30 yards). As for adults using kids in order to be able to violate, to bag big bucks, I highly doubt it happens anywhere near as rampant as the rumor mill claims. Yes, there are lowlifes out there and they have always been around and always will be (you can’t change “stupid”). Personally, if I ever encounter any I will turn them in, instead of only wringing my hands and complaining. It is what it is. Bob Walker of Kingston and I share a lot in common, which is involving family in sharing a quality experience in the outdoors. We both learned to hunt from older hunters, well before Hunter Education requirements, and we didn’t have any special youth hunts while growing up. Bob can readily remember when his two sons Ryan and Lane, had to wait until they were 14 (as we did also) before they could hunt deer with a gun, even though they were ready to do so at a much younger age. With grandchildren now in the picture, Bob is real pleased with the Mentor hunting licenses as well as the special youth deer season, and both boys and girls get into the act on a level playing field. Last weekend his 13 year old grandson Hugh Walker of Cass City bagged a still in velvet 3-point, with a 20 ga (Hugh has a Hunter Safety Certificate, but was able to start hunting at age 8 due to the Mentor hunting licenses). Bob’s 10 year old granddaughter Gracy Walker of Kingston bagged a 7-point and her 8 year old sister Molly bagged a 10 point. Both granddaughters were using .50 caliber muzzleloaders (which offers a mild recoil) proving that little girls can get matters done quite effectively. Don Burnette of Cass City also appreciates the Mentor hunting licenses that allowed his son Zack to be able to share hunting (and quality time) with him beginning at age 7. Now 10, Zack bagged a 3 point last weekend, also using a .50 caliber muzzleloader. My son Jake appreciates the Mentor hunting licenses as well that had allowed his daughter McKenna to begin hunting with him at age 8 (she now has her Hunter Safety Certificate). 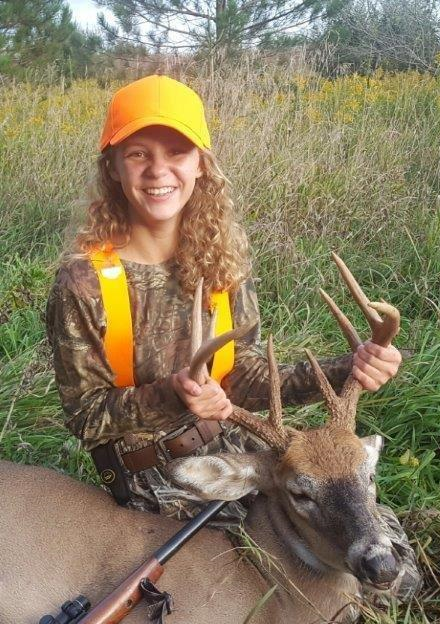 They were sitting together in a two-person ladder-stand last weekend when 12 year old McKenna used a .44 Magnum single-shot H&R rifle to put a 10 point right down on the spot. Personally I’m very proud of all these young hunters for accomplishing an actually serious task, that of killing an animal, and doing it respectfully, and doing it right. 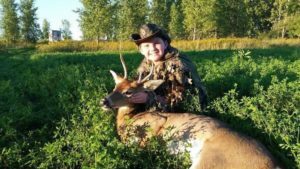 In my opinion (and many others), allowing kids to have a jumpstart into hunting thanks to the special youth hunts and the mentoring hunting licenses, is a very good thing in regards to the future of hunting.